The farmers market was full of apricots and I wanted to do something with them. I remembered seeing a recipe for a Thai inspired apricot chicken a while ago and I liked the sound of using apricots in a savoury dish. I also really like the sound of using Thai flavours as I was itching to use some more of the red curry paste that I had just made. In addition to an apricot sauce I wanted nice chunks of apricots as well as the chicken to form the body of the curry. I was thinking that I would make a pretty standard Thai curry except that the coconut milk would be replaced by pureed apricots. Since I was already using apricots I thought that it would be nice to use some apricot preserves for the sweetener instead of the palm sugar. The apricot chicken curry came together quickly and easily and it was really good! The apricot sauce was a nice balance of sweet, salty, tart and spicy and it was so full of apricot goodness. I really enjoyed the fruit based curry sauce. I served the apricot chicken curry on some aromatic coconut jasmine rice. Puree the apricots, apricot preserves, fish sauce, lime juice and zest in a food processor. Add the red curry paste and saute for a minute. Add the chicken and the apricot sauce and simmer until the chicken is cooked, about 6-10 minutes. Add the apricots and simmer for a minute. Serve on coconut jasmine rice and garnish with sliced red chilies. Option: For One-Pan: Make this a one-pan meal by adding 1 cup of rice and 2 cups broth or water (or 8 ounces of pasta and 2 1/4 cups broth or water) to the sauce in step 4 and simmer, covered, until cooked, about 20 minutes (or 12 minutes for pasta). Thats lovely! Summer fruit and colors of fall. Though I rarely eat them, I do like apricots. I have yet, I think, to ever cook with them! Must thing about that next time I’m at the farmers market and they are available. Chicken and curry seems like a great combo! You are so creative with food! You certainly don’t eat boring dishes anymore! yum. it is so colorful. That’s quite an inventive dish! I had never heard of pairing apricots with curry but I like it. Wow, apricot and curry…now that sounds yummy! I have had dried apricots and curry in a cous cous salad before, but I never considered it hot with chicken. Nice idea. I do an apricot beef stir fry that is excellent, but I had never thought of using them in curry. This looks super, Kevin. That’s gorgeous and a great use of summer fruits. I made blueberry muffins this weekend too. Gotta get those last blueberries in. I love your playful curries Kevin. This one looks great. 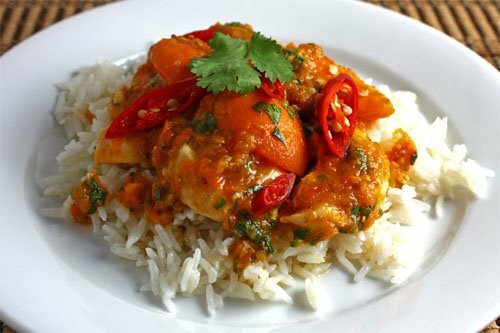 what a creative idea using apricot for curry chicken!! Yummy supper. I love curries. This is nice with the apricots. A gorgeous dish! What a flavorful combination! What an interesting curry! Chicken and apricots go so well together. It looks delicious! Sweet and spicy..that goes so well with rice! I neve had apricots in a curry! You’re so clever! I heard about apricot curry but never tried it,sounds great and looks Fantastic. Oooh, the fruit-based curry sauce sounds enticing! sounds delicious! can’t go wrong with a spicy and sweet combination. My mouth is watering after looking at your dish and I’m not even a fan of curry! I do love apricots, and a sweet accompaniment to chicken is always terrific. What a wonderful recipe. I love fresh apricots and I am sure they are fantastic with curry. Nice job. This sounds wonderful. I have a recipe for chicken and apricot jam and yogurt. Very easy but not everyone in my family really likes it. This sounds like a great one to try since I really love apricot flavor and chicken. I would of never have thought to use Apricots in a curry. Excellent idea! What a great sounding combination! I am now craving this!! Looks like you have a bit of heat going on in there – looks good. You are so inspiring! I have always used apricot preserve as some base for chutney for sandwiches, but never curry! Looks so good!! Oh yeah apricots and curry are such a good and powerful combo–I love this! Love the colors in this dish! Superb! you always have the most creative recipes! i love how they are inspired by what you find at the farmer’s market. unfortunately, there aren’t any markets closeby to me – i go to one close to my work that’s open once a week – but nothing near my home. i would never have thought of an apricot curry but would love to try this sometime. I love this dish! So creative and delicious! yummmm…..this is going on my “to make” list! Thanks! gorgeous curry! does the apricot preserve make it quite sweet though? looks fantastic – my mum used to make something like a mango curry. this reminds me of it. what a beautiful dish! this makes me want curry. Apricot curry – one gorgeous dish kevin! Oh Kevin, this appeals to my South African heart! We are always cooking meat/poultry with fruit, and apricots are a favourite. My mom used to make an apricot and mayonnaise chicken casserole that was my favourite. The farmer’s market you go to must be amazing! You have a never ending supply of good stuff! Mmmm, this sounds so good. I have a bunch of apricots coming in my produce box this week, I think I know what I’ll be doing with them. Kevin, what a creative dish you’ve made! I love apricots in savory dishes – we use them in toppings for pilaffs mostly, with lamb and other yummy goodies. Your recipe is fantastic! This looks so yummy! I bet apricot added great taste to the curry. Yum, I love mixing fruit into a savory dish. Plus I love curry! This recipe is awesome. Thankyou. Is the fish sauce necessary? It doesn't sound too appealing.. Anonymous: Soy sauce would work as well if you prefer.